Leaving my camp, one mile south of Centreville, at 2.30 a.m. of that day, I marched at the head of your division, as ordered, with my command in column, in the following order: The First Regiment of Ohio Volunteers, Colonel McCook; the Second Ohio, Lieutenant-Colonel Mason; the Second New York State Militia, Colonel Tompkins, and Captain Carlisle's battery of light artillery, six brass guns. To Captain Carlisle's command was also attached the large Parrott gun (30-pounder), under direction of Lieutenant Hains, of the Artillery Corps. Proceeding slowly and carefully, preceded by five companies of skirmishers of the First and Second Ohio, which I threw out on either side of the road, we approached the bridge over Bull Run, beyond which the rebels were understood to be posted and intrenched, and to within a distance, perhaps, of three-fourths of a mile of their batteries on the other side of the stream. In obedience to your command, on first discovery of the presence of the enemy's infantry forming into line on the hill-side beyond the Run, I deployed my three regiments of infantry to the left of the road, and formed them in line of battle in front of his right. Thus my command was constituted--the left wing of our division, Colonel Sherman's brigade, coming up and taking position to the right of the road. After the fire had been opened by discharge of the large Parrott gun from the center in the direction of the enemy's work, I moved my extended line gradually forward at intervals, taking advantage of the ground, until I had my force sheltered partly in a hollow, covered by a ridge and wood in front, and partly by the edge of the timber lying between us and the run. Here we lay, in pursuance of your orders, for, perhaps, two and a half or three hours, with no evidence of our nearness to the enemy except the occasional firing of musketry by our skirmishers in the wood in front, answered by the muskets or rifles of the enemy, to whom our presence and position were thus indicated, with a view to distract his attention-from the approach of Colonel Hunter's force from above and in his rear. 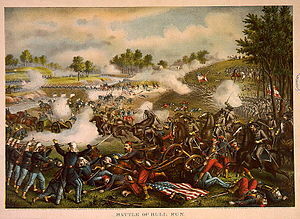 At this time I received your notice and order announcing that Hunter was heard from, that he had crossed, and was coming down about two miles above us, and directing that if I saw any signs of a stampede of the enemy in front I should make a dash with the two Ohio regiments, keeping the New York regiment in reserve. For this movement I immediately formed and prepared. Soon after, and when, by the firing of artillery and musketry in front at the right, it appeared that the rebels were actively engaged in their position by our forces on the other side of the stream, I received your order to extend my line still farther to the left, sending forward Colonel McCook's regiment to feel the battery of the enemy, which was ascertained to be on the hill covering the ford, half a mile below the bridge, and supporting him with my two other regiments. This was immediately done. Colonel McCook advanced in that direction along the road, which we found to be a narrow track through a pine wood, thick and close with undergrowth, and flanked on either side by ambuscades of brush-work, which were now, however, abandoned. Reaching the head of this narrow road where it opened upon the stream, Colonel McCook found the battery to be a strong earthwork immediately opposite, mounted with at least four heavy guns, and commanding the outlet from the wood. An open space of hollow ground lay between, with a corn-field to the left, the direct distance across to the enemy's battery being about three hundred and fifty yards. Behind this battery, and supporting it, were discovered some four regiments of the rebel troops, while rifle-pits were seen directly in front of it. The First Regiment was then deployed to the left in the edge of the woods and into the corn-field, one company (Captain Kell's) being thrown forward towards the run up to within perhaps twenty yards of the battery. While this was done I advanced the Second Ohio, followed by the Second New York, toward the head of the road, in supporting distance from the First Ohio, Lieutenant-Colonel Mason's regiment filing also to the left. Receiving Colonel McCook's report of the battery, and that it would be impossible to turn it with any force we had, I immediately dispatched a message to the center to bring up some pieces of artillery, to engage the enemy from the head of the road. In the mean time the enemy, discovering our presence and position in the woods, and evidently having the exact range of the road we were occupying, opened on us with a heavy fire of shells and round and grape shot. To avoid the effect of this as much as possible, I ordered the men to fall back into the woods on each side of the road, and was presently re-enforced by two guns of Ayres' battery, under Lieutenant Ransom, which passed to the head of the road. A brisk cannonading was then opened, but a very unequal one, on account of the superior force and metal of the enemy. While this continued, I left my horse and passed through the woods, and remained some time by our guns, to be satisfied whether we were making any impression on the enemy's work. I soon found that it was not thus to be carried, and such also was the opinion of the officer in charge of the guns. Retiring, I found that the most of my two regiments in the rear had fallen back out of range of the hot and constant fire of the enemy's cannon, against which they had nothing to oppose. The suffering from this fire was principally with the Second New York, as they were in the line where most of the shell and shots fell that passed over the heads of the Second Ohio. Taking with me two companies of the Second Ohio, which were yet in the woods maintaining their position, I returned to cover, and brought away Ransom's guns. It was just at this place and point of time that you visited yourself the position we were leaving. I must not omit to speak with commendation of the admirable manner in which these guns of ours were handled and served by the officers and men having them in charge; and I may notice the fact also that, as we were withdrawing from this point, we saw another heavy train of the enemy's guns arrive and move up the stream on the other side of their battery with which we had been engaged along what we supposed to be the road from Manassas towards where the battle was raging with our troops on the right. My three regiments being all called in, then returned and rested in good order at the center of the front, near the turnpike. Here I was informed by Colonel McCook that you had crossed the run above with other portions of our division, and left with him an order for me to remain with my infantry in that position supporting Carlisle's battery, which was posted close to the road on the right. This was about 1 o'clock p.m. Captain Carlisle, while we thus rested, was playing with much apparent effect upon the enemy's works across the run with his two rifled pieces, as was also Lieutenant Hains with the large Parrott gun. Soon after, having successive and cheering reports, confirmed by what we could observe, of the success of our Army on the other side of the run, I discovered that bodies of the enemy were in motion, probably retreating to their right. To scatter these and hasten their flight I ordered into the road toward the bridge the two rifled guns, and had several rounds fired, with manifest severe effect. This, however, drew from the enemy's batteries again a warm and quick fire of shell and with rifled cannon on our position in the road, which continued afterwards and with little intermission, with loss of some lives again in my New York regiment, until the close of the fight. While this was going on, Captain Alexander, of the Engineer Corps, brought up the company of pioneers and axmen, which, with its officers and sixty men, had been entirely detailed from the regiments of my brigade, to open a communication over the bridge and through the heavy abatis which obstructed the passage of troops on our front beyond the run. To support him while thus engaged, I brought and placed on the road towards the bridge McCook's and Tompkins' regiments, detailing also and sending forward to the bridge a company of the Second New Yorkers, to cover the rear while cutting through the enemy's abatis. 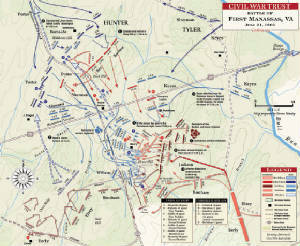 A second company from Lieutenant-Colonel Mason's command was also brought forward with axes afterwards, to aid in clearing the obstructions, and thus in a short time Captain Alexander succeeded in opening a passage. Captain Carlisle's battery was now posted on the hill-side in the open field to the left of the road toward the bridge. Very soon after, some reverse of fortune appearing to have taken place with our troops on the other side, who were falling back up the run, it was discovered and reported to me that a large body of the enemy had passed over the stream below the bridge, and were advancing through a wood in the low grounds at our left, with an evident purpose to flank us. To intercept this movement, I ordered forward into the road still lower down two of Carlisle's brass howitzers, a few rounds from which, quickly served, drove the rebels from the wood and back to the other side of the stream. It was not long after this that the unpleasant intelligence came of our Army being in retreat from the front across the ford above, and the order was given to fall back on Centreville. The retreat of my brigade, being now in the rear of our division, was conducted in the reverse order of our march in the morning, the Second New York moving first, and being followed by the Second Ohio and First Ohio, the two latter regiments preserving their lines in good degree, rallying together and arriving at Centreville with closed ranks, and sharing comparatively little in the panic which characterized so painfully that retreat, and which seemed to me to be occasioned more by the fears of frightened teamsters, and of hurrying and excited civilians (who ought never to have been there), than even by the needless disorder and want of discipline of straggling soldiers.